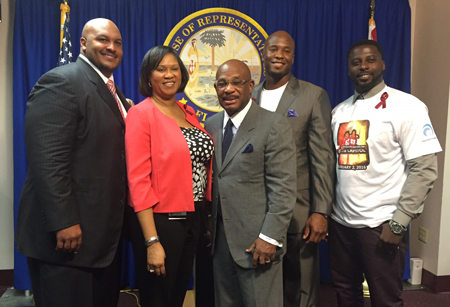 TALLAHASSEE, FL – Prominent attorney Willie Gary of the Stuart, Florida based law firm of Gary, Williams, Parenti, Watson & Gary, P.L.L.C., along with football wide-receiver Devard Darling and nearly a dozen NFL players gathered in Tallahassee, Florida in memory and support of Devaughn Darling. Gary and Darling made the request for immediate action from the State Legislature and petitioned for the authorization of the claims bill, in the case of Devaughn Darling. The wrongful death lawsuit filed by the Gary Law Firm settled for $2 million in June 2004, of which Florida State University paid $200,000. Gary and his legal team have pursued the remaining $1.8 million that must be approved by the Legislature since that time. At the press conference, NFL star Devard Darling, former wide receiver for the Baltimore Ravens, spoke out for the first time about the sudden and unnecessary death of his twin brother, Devaughn. Devaughn Darling, an 18-year-old freshman linebacker for the Florida State University football team collapsed and died, while participating in a series of intense conditioning tests in February 2001. Devard Darling traveled to Tallahassee to meet with the leadership of the State Legislature, in an effort to bring about awareness of the untimely death of his brother and to impress upon the legislature the need to approve the claims bill. This was Devard Darling’s first time returning to Tallahassee since the death of his twin brother. During his visit, Darling visited the Devaughn Darling Memorial Tree at Doak Campbell Stadium. Darling also hosted a VIP reception at the Governor’s Club, showcasing the work of the As One Foundation, which he established in honor of his brother with the mission to educate and increase awareness of the sickle cell trait while encouraging youth to achieve their dreams in the face of life's challenges. “I am thankful that we were able to turn to one another to seek resolution and understanding in this matter,” commented Gary. “However, make no mistake that there is no amount of money that can compensate for the loss of a child. Devaughn was more than just a great athlete. He was a phenomenal person who was a role model for many young boys and girls and he died prematurely and unnecessarily,” Gary continued.